Is there the belief that black life is not as valued in our nation as white life? Indeed, a new slogan has emerged: "Black Lives Matter." Perhaps, Martin, that is still what is at the heart of the great racial divide in America. Still, it appears, the matter of one's worth as a human being is finally about the color of one's skin — not the content of one's character, morality, ability or competence. Indeed, there seems no correlation between scoring a winning touchdown or basket, or between one's abilities, political positions or party and one's determined ultimate worth as a human being. Could it be that in the minds and hearts of so many, skin color determines worth and value? We continue to face a lot of work in this nation on the issue of race. At times, we appear to move backward and forward simultaneously. 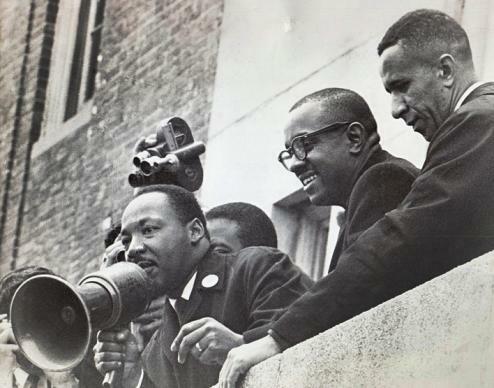 The truth is, Martin, the events of the last 50 years are evidence of how far we have come on our journey to become "one nation under God, indivisible, with liberty and justice for all." But, the last 50 days are evidence as well of how far we have yet to go! EDITOR'S NOTE: Each year, retired United Methodist Bishop Woodie W. White writes a "birthday letter" to the Rev. Martin Luther King Jr. White, now bishop-in-residence at Candler School of Theology at Emory University in Atlanta, was the first general secretary of the General Commission on Religion and Race. After grand jury rulings, what is the church's witness?